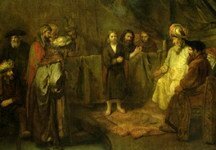 In Genesis 17, we read that God promises Abraham that he will be the father of many great kings and nations. He also promises to bless all nations through Abraham’s offspring. Abraham was already 99 years old, and Sarah was well beyond child-bearing years. Yet God is true to His word, and their son is born. Isaac was tangible, living proof of God’s promise to Abraham and Sarah. No doubt they loved their son deeply. But God tests Abraham, and asks him to sacrifice Isaac as a burnt offering. A seemingly unbearable request! While Abraham may not have understood why God was asking this of him, he trusted God completely, knowing that God’s commands are always good, and that His promises to Abraham would not be broken. 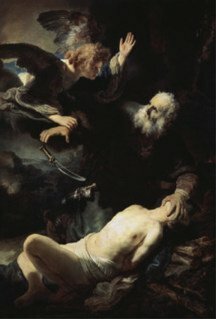 In unwavering faith, Abraham tells Isaac, “My son, the Lord will provide a lamb for a burnt offering.” In complete obedience, Abraham binds his son, and raises his knife. 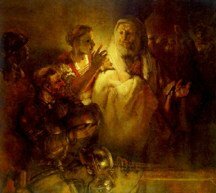 In this painting we see an angel of the Lord calling out to Abraham, saying: “Abraham, Abraham! Do not lay your hand on the boy or do anything to him, for now I know that you fear God, seeing you have not withheld your son, your only son, from me” (ESV). Faith and obedience go hand-in-hand. God tested Abraham’s obedience by asking him to give up his son. Abraham’s faith in God and trust in His promises enabled him to be obedient. God did indeed provide a lamb—Abraham sees a ram caught by its horns in the bushes, and offers it as a burnt offering instead —and Isaac’s life is spared. Many generations later, God would provide another Lamb. This Lamb would be His own son, Jesus, who would come to rescue you from the grip of sin. God loved you so much that He was willing to sacrifice His only son, His Lamb, for your salvation. Isn’t it remarkable that God’s promise to bless Abraham so long ago was also God’s promise to you! There is no greater love, no greater sacrifice than this. Our Heavenly Father always welcomes and blesses those that repent and turn to Him. He is our Comforter, Healer, Provider, Restorer, and Redeemer! Perhaps you have made some bad choices, and can’t seem to find your way out – do not despair! Your Father is waiting for you to come back to Him. He is forever faithful and you are forever in His grip. He forgives, restores and comforts those who turn to Him. 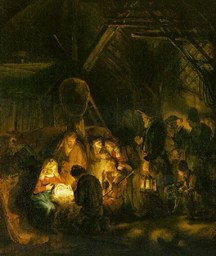 God sends His Son into the world! 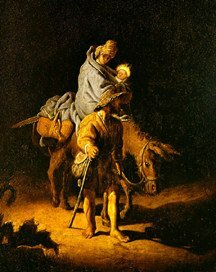 Joseph and Mary, heavy with pregnancy, travel to Bethlehem to be registered in the census. The long-awaited Messiah arrives in the most humble of circumstances. No rooms are available in the local inns, so Mary gives birth to the baby Jesus in a stable, wraps him in cloths, and lays him in an empty feeding trough. “And in the same region there were shepherds out in the field, keeping watch over their flock by night. And an angel of the Lord appeared to them, and the glory of the Lord shone around them, and they were filled with great fear. When God’s son was born into this world, He did not send His angel to announce the arrival to kings, the powerful, the rich, or even the Jewish religious leaders. Instead they announced the birth of Jesus to a small band of poor shepherds in the fields. Because the duties of a shepherd required that they remain in the fields with their herds, they were generally unable to participate in Jewish ceremonies and rituals and were therefore held in very low esteem. Why did God choose to bring His good news to the shepherds first? Perhaps He wanted the world to know that His plan of salvation included the impoverished, the weary and the despised as well as the mighty and powerful. The world may measure a person’s worth by their stature, power, beauty, intellect, or wealth, but God looks at the heart. He sees our souls laid bare and in great need of His Savior. God sent His Son to redeem the least likely as well as the most ordinary, like you and me. An angel of the Lord appeared to Joseph in a dream and said, ‘Rise, take the child and his mother, and flee to Egypt, and remain there until I tell you, for Herod is about to search for the child, to destroy him.’ And he rose and took the child and his mother by night and departed to Egypt and remained there until the death of Herod” (ESV). King Herod lived in constant fear of being overthrown, and was very protective of his throne. As a young man he had seen his father poisoned and had witnessed much unrest and war. In 37 BC, he became king of Judea and was entitled, “King of the Jews.” Any threats to his throne were met with swift retribution. He even suspected his own sons of conspiracy against him, and had them executed. Imagine his great fear when the three magi reported to him that they had seen the new “King of the Jews!” So King Herod tries to do what he does best—eliminate the competition. He orders that all infant boys under the age of two be killed. But God has other plans for His young Son, and sends an angel to warn Joseph and Mary, and the life of little Jesus is spared. * The wise men were magi; astrologers from the royal court of the king of Persia. Every year, Jesus and his parents traveled to Jerusalem to attend the Feast of Passover. The feast was now over, and Mary and Joseph were on the road back to Nazareth, but they could not find Jesus among their group of friends and relatives. So they headed back to Jerusalem. “After three days they found him in the temple, sitting among the teachers, listening to them and asking them questions. And all who heard him were amazed at his understanding and his answers. And when his parents saw him, they were astonished. And his mother said to him, ‘Son, why have you treated us so? Behold, your father and I have been searching for you in great distress.’ And he said to them, ‘Why were you looking for me? Did you not know that I must be in my Father’s house?’ He returns home with his parents and “grows in wisdom and stature, and in favor with God and men” (ESV). In this painting, we see that Jesus has settled in among the scribes. He participates in their discussions, He asks and answers questions, and the scribes are astonished at His apparent wisdom and understanding of Jewish law. Life here on earth places us squarely in the middle of many dangerous storms and perils. 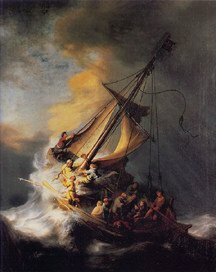 We are much like the tiny ship that is tossed about during a tempest at sea. Violent waves crash over our decks, our timbers groan and splinter, we succumb to fears of unseen dangers presumed lurking in the waters below, and we feel like we are sinking. Jesus promised, “I will not leave you as orphans; I will come to you,” before He ascended into heaven after rising from the dead. He is always here with us, and no matter what our circumstances, we will never be alone. Will He spare us from the storms of life that occur so frequently in a world ravaged by pain, and sorrow? God shields and protects us from some perils, but in His infinite wisdom, He may allow us to face others as part of His plan for our lives. And He promises to walk with us and care for us while we weather difficult times. When we find ourselves being tossed about, we can call upon His name. He will answer, and His strength and peace will equip us to face life’s challenges. Satan is alive and well on this earth. He schemes and plots, but God’s plans always prevail. So when you feel besieged by life and find yourself ensnarled in circumstances that leave you shaken and bewildered, take heart in knowing that God uses these events to draw us and then teach us how reliable He is, to grow our faith, and to bring about His good will for our life. “Now Peter was sitting outside in the courtyard. And a servant girl came up to him and said, ‘You also were with Jesus the Galilean.’ But he denied it before them all, saying, ‘I do not know what you mean.’ And when he went out to the entrance, another servant girl saw him, and she said to the bystanders, ‘This man was with Jesus of Nazareth.’ And again he denied it with an oath: ‘I do not know the man.’ After a little while the bystanders came up and said to Peter, ‘Certainly you too are one of them, for your accent betrays you.’ Then he began to invoke a curse on himself and to swear, ‘I do not know the man.’ And immediately the rooster crowed. And Peter remembered the saying of Jesus, ‘Before the rooster crows, you will deny me three times.’ And he went out and wept bitterly” (ESV). During His last supper with his disciples, Jesus predicted that all of his disciples would eventually betray him and scatter. They dismiss his warning and proclaim their loyalty to Him. But in less than 24 hours, all twelve disciples will betray him. Judas sells Jesus for a few pieces of silver, and loses his life for an eternity. Peter denies Jesus three times, and the remaining disciples become fearful and flee when they realize that Jesus is to be crucified. In particular, Judas’ sins gained momentum. Greed, love of money, and desire for personal gain gave Satan the opportunity to plant the seeds of betrayal in Judas’ heart. As much as Judas was the betrayer, he himself was also deceived and betrayed by Satan. 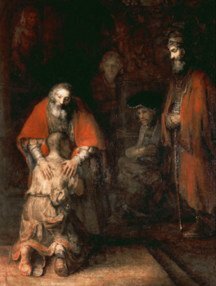 Judas did not have a repentant heart, nor was he a true believer. Know for certain that those who truly believe in Christ will never finally be lost. We may lose our way and stumble in our faith, but Jesus will not give us up. He always brings us to repentance and back into complete fellowship with Him. 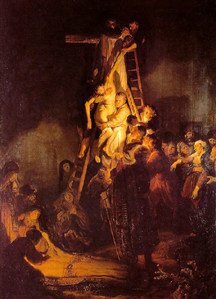 In this painting, we see the body of Jesus being gently carried down from the cross. “When it was evening, there came a rich man from Arimathea, named Joseph, who also was a disciple of Jesus. He went to Pilate and asked for the body of Jesus. Then Pilate ordered it to be given to him. And Joseph took the body and wrapped it in a clean linen shroud and laid it in his own new tomb, which he had cut in the rock. And he rolled a great stone to the entrance of the tomb and went away” (ESV). Why did Jesus have to die on the cross to forgive us? Couldn’t God have forgiven and redeemed us without requiring that Jesus give up His life as a sacrifice? Sin is rebellion against God, against His laws and commands. We can easily fail to see how deeply rooted sin is in our hearts, that the real issue is the corruption of our beings as persons. We also can underestimate God’s majesty, purity, and sinless character. As a result, we do not consider how diametrically opposed our sinful nature is to His sinless character. Sin is deeply engrained in us. It is not like an annoying habit that we can change. It is a principle of destruction that affects extend beyond ourselves and others. Sin is evil. It forms a wall of alienation between God and us. That God would even want to rescue us is remarkable. Not because of our goodness but because of His goodness, He loves us still. How can God forgive us without compromising his holiness? Surely He cannot pretend that sin does not exist or that it does not matter. How can He bring us back into fellowship with Himself? Light and darkness have nothing in common. “As they were talking about these things, Jesus himself stood among them, and said to them, ‘Peace to you!’ But they were startled and frightened and thought they saw a spirit. And he said to them, ‘Why are you troubled, and why do doubts arise in your hearts? See my hands and my feet, that it is I myself. Touch me, and see. For a spirit does not have flesh and bones as you see that I have.’ And when he had said this, he showed them his hands and his feet. And while they still disbelieved for joy and were marveling, he said to them, ‘Have you anything here to eat?’ They gave him a piece of broiled fish, and he took it and ate before them. Then he led them out as far as Bethany, and lifting up his hands he blessed them. 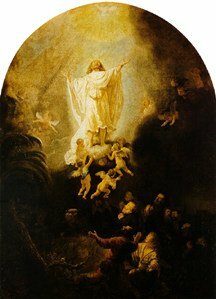 While he blessed them, he parted from them and was carried up into heaven. And they worshiped him and returned to Jerusalem with great joy, and were continually in the temple blessing God” (ESV). Jesus’ resurrection is proof to the world that the message of the Bible is indeed true. Jesus was crucified, and rose again, victorious over death. Jesus is the Messiah, sent by God to redeem all who place their faith in Him. The penalty for sin has been paid, and believers are assured that they are forgiven and have eternal life.